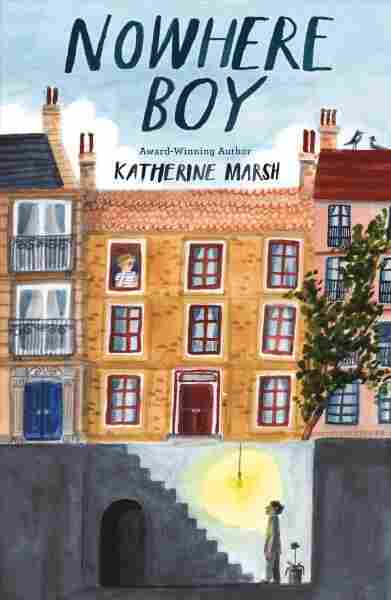 A Syrian Orphan Alone In Brussels In 'Nowhere Boy' Katherine Marsh's book Nowhere Boy is the story of a 14-year-old Syrian refugee in Brussels, and his friendship with an American boy. She talks with NPR's Rachel Martin. In the book, the boy, 14-year-old Ahmed, and his father were originally trying to get to England, but as an orphan alone in Brussels, that dream fades. Instead, he finds himself hiding in a house where, upstairs, an American family — including a 13-year-old boy named Max — lives. Max finds Ahmed, and the two become friends. The book is rooted in the time that Marsh and her family — including two young children — spent in Belgium after moving there from the U.S. in 2015. Her family was in Brussels during the refugee crisis and the 2016 terrorist attacks. "Children love stories, and this at its heart is a story. It's an adventure story, it's a story about friendship, it's a story about belonging, and I think when I tell a story for children that may have these larger ideas in it, I try to keep to the idea of connecting you to the character's specific experience rather than talking in a large, pedantic way about it," she tells NPR. That year was the height of the refugee crisis. There were more refugees coming in to Europe – I think it was about a million that year. There was also a lot of news events that year, including the Brussels lockdown following the Paris terror attacks [in Nov. 2015], and then in the spring of 2016, Brussels had a terror attack. And that brought up a lot of issues that I thought would be interesting to write about. ... Schools closed down when we had the Brussels lockdown. And I actually had to explain to my children why they weren't going to school and what was happening. And it was interesting because when we lived in America, I did talk with them about the threat of gun violence and what to do, and I thought I wouldn't be having those conversations when I got to Europe. Instead I was having another type of conversation, which was what to do in case of a terrorist attack. Parc Maximilien, which is one of the central urban parks of Brussels, became a Red Cross camp for refugees. And when you went in that area you would actually see a number of refugees camping outside waiting to try to get some sort of immigration status. You would see refugees occasionally on the street asking for money. There were a lot of neighbors and friends we knew who ended up doing volunteer work to help refugees. So that was just part of daily life. In addition, you would hear a lot of different opinions about the refugees, ranging from people who felt that Europe needed to keep them out, that they were threatening what Europe was to ones that were more welcoming but were dealing with these real questions of how do we integrate this many people into society and what's the best way to do that. I wrote this book in part because I wanted to help my children process this year in Europe. And I think that there are ways to write for children without being overtly graphic, but at the same time being honest. And I think it's important because kids do observe the world, they do see a lot and they pick up on attitudes particularly. And one of the things that I wanted to do with this book is to really start to separate feelings and facts, which was a real problem in Europe, where people were having a lot of strong feelings about things, but they weren't always connected to the facts on the ground. For example, people said "There are refugees, and they're terrorists." And the truth was that most of the terrorists were actually born in Europe. What I did is I went out and I interviewed a number of people — both Syrian refugees, unaccompanied minor, people who worked with refugees – and I tried to get as much kind of factual detail as possible in order to bring [Ahmed] and his experience to life. Noor Wazwaz and Joanne Levine produced and edited this story for broadcast. Heidi Glenn adapted it for the Web.